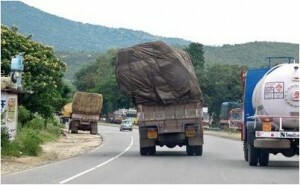 Overloaded vehicles are becoming the major cause of mishappenings. Because of overload, it reduces the driver’s efficiency to break and steer and it can lead to an accident. Due to unnecessary stress on the engine, Increase the Chances Of tires failure. It reduces the vehicles stability. It damages the national road and it is an illegal activity. To preventing overloading drivers should follow the weigh in motion system. It reduces the accident chances, needs to have a safety culture. Drivers must understand weigh legislation. Drivers, vehicle owners and vehicle operators are responsible for overloading. Drivers should know what is safe to load. Drivers should also be mindful of the problems of overloading. Driving speed must be slow. WIM reduces the damage of breaking system also. Roads and streets are the most important transport communication medium in the country. Overloading vehicles become a traffic hazard, especially regarding the heavy vehicles. Breaking system and additional breaking distance involved. We should avoid the overloading of vehicles. It is our social responsibility also. Overloaded vehicles have become a major problem for all road users and day-by-day it continuously increasing. Now the time has come to overcome such a problem. If not completely eliminate we can at least reduce this problem to some extent. The main reason of overloaded vehicles is that truck drivers have not adequate amount of work, which they required. They bounded to do that work because they have not any other option that is why they overloaded their vehicles to make their both ends meet.